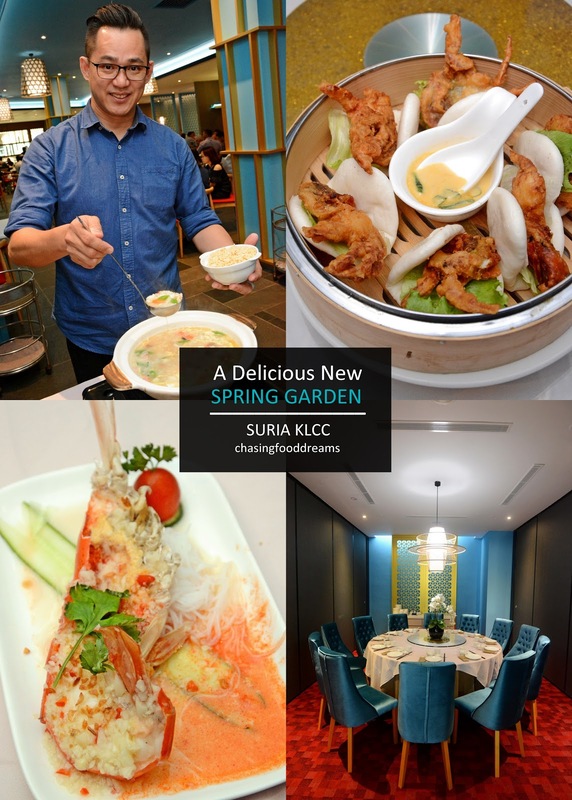 Located in the iconic hotspot of our metropolitan city, Spring Garden Restaurant has just taken on a new spring outlook in KLCC. Under the umbrella of the Tai Thong group of restaurants, Spring Garden takes on fine dining Chinese cuisine served in an elegant and classy ambiance. The restaurant is pork-free and serves up a delectable menu of classic Chinese favorites along with a luscious array of dim sum daily. The new Spring Garden is a sight of vibrant opulence. Spaciously designed with modern contemporary elegance, the main dining area is set in shades of sky blue and red with injections of natural wood and other natural elements. There are some sections of dining area for diners who wishes for more discrete dining as well as private rooms. As with most Chinese restaurants, Spring Garden also has live tanks showcasing various seafood. At a glance, the plush thick menu is filled with tempting photos of beautifully crafted Chinese dishes along with the usual details. The menu is exceptionally large, showcasing Tai Thong Group Executive Chef Simon Lee and culinary team’s vast culinary skills and creativity. While waiting for our mains to be served, a little sneak peek at the dim sum selections available at Spring Garden took place as palate teasers. The classic must-haves such as Steamed Xiu Mai (RM10.80++) and Tai Thong Superior Har Gao (RM12.80++) won brownie points from our table. The dumplings were well-crafted with tasty notes and essential textures of dim sum. Crispy Shredded Duck Cheong Fun (RM13.80++) proved that a little twist won’t hurt a classic. The duck in the Cheong fun makes a nice change with its dark rich meat in the dish. The fried dim sum section holds a tasty list that includes Beancurd Roll with Prawn (RM12.80++) and Taro Dumplings (RM9.80++) among others. Both sufficiently tasty and satisfying as crown favorites in any dim sum feast. The contrasting black against the golden lava in Steamed Charcoal Buns with Durian and Salted Egg Yolk (RM15.80++) made a lovely sight. The unctuous richness of the durian coupled with salted egg yolk is deliciously divine together with the fluffy bao. If durian is not your thing, then there is also the Steamed Lao Sa Bao Buns with Salted Egg Yolk (RM9.80++). Moving to the regular Chinese menu, we had an appetizer of Soft-Shell Crab (RM58++/5pcs) served with steamed mantao and a side of aromatic salted egg sauce in a basket. The clever combination of crispy and juicy soft-shell crabs with fluffy mantao pillow drenched with that sublime salted egg sauce is a winning dish with everyone that day. Spring Garden’s signature of Steamed Fresh Prawns with Minced Garlic and Glass Noodles (RM26++/100g) will certainly impress diners with the glorious sight of large fresh water prawn and its luscious prawn roes. Generously topped with minced garlic, the prawn was gorgeously fresh and sweet. Solid bouncy textures of the meat is laced with garlicky notes. One should not hold back and go straight for the sinful creamy roes for the ultimate enjoyment of the prawns. Lip-smacking yum!! The Braised Diced Chicken In Hot Pot (RM35++) was decent too in terms of flavours from the meaty chunks of boneless chicken with bell peppers and onions. The unctuous savory note of black bean sauce is the flavour base of the dish and its what made the dish tasty. A dish that came highly recommended by Executive Chef Simon is the Poached Fried Rice In Superior Broth (RM30++ per portion). This has to be my favorite dish for that day. Chef Simon personally finished the dish and served it that day. The soothing and warming flavour of the broth with two textures of rice, one steamed and one crispy fried, was superb. Also studded with bits of seafood, every spoonful of the rice soup is utterly heavenly and tummy warming. It’s a dish I can definitely enjoy daily! Do check out Spring Garden for more dishes as the menu is filled with lots of choices of classic Chinese dishes as well as other creative ones.